Setting up an effective estate plan is a common concern people have, especially as they get older. But the need to plan is at least as important for younger persons with children. Understandably, people want to preserve some portion of their property to help those who matter most to them. Certainly, a primary purpose of any estate plan is to make arrangements for the distribution of a person’s assets after death. But also of importance is a plan to protect the assets during the person’s lifetime to insure that there will be assets left to be distributed, especially in the event of some major financial event. Having the appropriate legal documents to avoid a guardianship, to plan for the possibility of expensive long term care, and having important medical documents in place, are all an integral part of a comprehensive estate plan. The true value of working with a qualified estate planning attorney is not just in making sure that all the needed legal documents are in place and properly written, but also in the advice and guidance given. Estate planning frequently involves a will, and may require carefully drafted language if there are specific ideas or details to be arranged. The documents also need to take into account the possibility that a designated heir may either predecease you or be incapacitated. The internet and media in general are full of advertisements for do-it-yourself estate planning documents, but these condense estate plans into one, inflexible cookie-cutter package, and don’t provide any professional advice as to alternative arrangements that might be more beneficial, or precise language that would accomplish your specific needs. Mistakes made in the drafting or even in the signing of legal documents can result in additional, expensive legal work to resolve those issues. In some instances, these mistakes may completely invalidate the intended result. 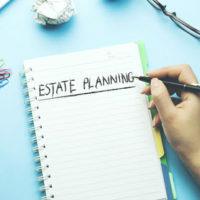 Even when a person does take the proactive step of executing an estate plan under the advice of an attorney, keep in mind that there will still be life changes and a myriad of issues, that might need to be addressed or they can create problems for loved ones when they attempt to implement the established estate plan. An overview of several mistakes people sometimes make that can derail the execution of an estate plan, and how to avoid them, will follow below. Individual retirement accounts, or IRAs, are investment vehicles used by millions of Americans as a safe way to save for retirement, and typically include a designated beneficiary in case the account is not depleted when the account holder dies. Most IRAs name an identifiable person as the beneficiary, but in some circumstances (to constrain a spendthrift or when the beneficiary is minor, for example), it may be tempting to name a trust instead. Individual beneficiaries to IRAs are typically permitted to spread out distributions based on the life expectancy of the designated person. However, if a trust is named as the beneficiary of an IRA, this benefit can be lost and require the liquidation of the account within five years, and taxation at a higher rate. With careful drafting a trust can be treated as a “see through” trust, in which case the IRS treats the beneficiaries of the trust as the de-facto beneficiaries of the IRA. With a “see through” trust the trust retains the ability to stretch out the distributions over the lifetime of the trust beneficiary. In addition, the trust must be properly drafted to handle the annual IRA distributions to avoid undesirable tax consequences. Consulting with an experienced estate planning attorney will help to insure that a “see through” trust will operate as planned. Often, a secondary goal of estate planning is to avoid the costs associated with probate, and any asset that is solely owned by a person at death could be subject to this process, including financial accounts. But, by adding the designations of “Payable on Death (POD),” “Transfer on Death (TOD),” or other beneficiary arrangements to a financial account, the asset will pass outside of probate and be distributed according to the contractual arrangement made with the financial institution. Typically, beneficiary distributions are made quickly and at minimal expense as no attorney or court is involved. These arrangements can save loved ones considerable time and money. Verifying that bank accounts, money market accounts, CD accounts, saving accounts, brokerage accounts, insurance policies, annuities, IRA’s and other financial accounts have these arrangements in place is a reasonably easy, and very important step to taking control of one’s estate plan. An essential part of any estate planning consultation is to carefully review these arrangements, not just to insure that these arrangements were made, but to insure that they are properly integrated into the overall plan. Inquiring into these arrangements has disclosed that clients often don’t know whether or not these arrangement were set up, or how they were set up. Putting together a solid estate plan is one of the best decisions you will make, and one that will be felt far into the future. To ensure your wishes are followed and your family is protected, talk to an estate planning attorney about the options that would best fit your situation. Elder law attorney William Rambaum helps seniors everyday plan for their needs during life and to leave a legacy to benefit future generations. William Rambaum, P.A. serves clients in the Clearwater and Oldsmar area. Contact the office today to request an appointment.